Confused by some of the terms you’ve heard in the chemical manufacturing industry? Take a look at our chemical glossary for answers! If you’re struggling to find what you’re looking for here, give us a call or contact us via our website and one of our technical team will be happy to help. The 8D problem solving model is a method used to solve problems encountered in the workplace, which is devised of 8 separate stages or “disciplines”. The main aim of the process is to work out the root cause of the problem and put procedures in place to ensure the problem has been dealt with thoroughly, so that it won’t arise again. Before the problem can be properly solved, it is important that the company management recruit team members to help that have the sufficient skills and time to invest in completing the 8D model. It may also be necessary for temporary procedures to be put in place whilst the stages are being worked through, to stop the problem from expanding. The 8D model puts emphasis on congratulating the team and perhaps making permanent changes to processes or standards in the workplace, which all team members should be made aware of. ADR refers to a European agreement concerning the international transport of dangerous goods by road. In the chemical industry, it is important that Hazardous and Dangerous Goods are transported by ADR couriers to ensure they are delivered safely. The ADR agreement is there to ensure all hazardous products are labelled clearly to describe the classification of Dangerous Goods, general requirements, conditions of transportation (such as loading, unloading and handling) and others. It also states that packaging should be tested for safety and that vehicles need to be approved. Not all couriers are equipped to transport Dangerous Goods under ADR regulations. Couriers must be trained in understanding chemical hazards as well as Local Rules and Risk Assessment. Vehicles used for the carriage of Dangerous Goods should be appropriately equipped to do so. The name ADR comes from the French name for the agreement which is: Accord européen relatif au transport international des marchandises Dangereuses par Route. An ampoule is a small container which resembles a bottle or vessel. It is sometimes made from plastic, although glass ampoules are more common as this is a stronger alternative and more effective at protecting the contents of the container. Ampoules are often used to contain chemicals or other pharmaceutical products that need to be stored in an airtight container, so they are protected from air or other contaminants. http://youtu.be/EPmIcG1RhJw Ampoules are filled and sealed by high-tech machines using heat. Flames melt off the top of the vial so they can be filled, and then a second flame is applied to hermetically seal the vial and protect the contents. When an organisation invites their customers to visit the premises in order to have a look around and personally see facilities and processes, they are allowing customer audits. A customer may audit the company they are receiving a service or a product from for a number of reasons. They may be interested in the technology that is used to manufacture a product, how advanced the facilities and machinery at the company are, or to check that the company’s hygiene or other quality levels are up to the standards that a customer would expect. An audit can also be carried out by a professional body, such as an organisation that sets guidelines and standards that a company in a particular industry has to adhere to. The investigation may be carried out to ensure that the company being audited is maintaining the promised standards. The company being monitored is usually told about the inspection in advance and observations are documented. A bottle is a container used for storing liquids, usually with a neck that is narrower than the body. Bottles can be made from a variety of materials. In the food and drinks industry, PET plastic is usually used as that is a safe option. However, bottles can also be made from glass, clay, aluminium and other materials. Bottles are often used for storing chemicals, and can store and transport substances in almost any volume. Bottles can be filled with volumetric bottle filling machines in an industrial setting, and usually have a lid that can be screwed and unscrewed for access to the product inside. BS 56093 is an internationally recognised standard, which is in place to ensure the durability of critical labels on industrial chemical containers. Under BS 56093, labels must conform to strict criteria that cover print permanence and abrasion resistance. For example, text on a label must remain readable after at least three months in the ocean. BS 56093 is a standard for labels of containers holding potentially dangerous or toxic goods. This requirement is put in place to be sure that if a product gets lost and is later recovered, the hazard and safety information will still be available and won’t present an unknown threat to the handler. CHIP stands for Chemicals (Hazard Information and Packaging for Supply) Regulations. CHIP symbols are a type of chemical hazard classification, implemented with an aim to protect people and the environment from negative effects of chemicals by requiring suppliers to identify the hazards of the chemicals they stock and distribute. CHIP regulations also state that suppliers must provide information about the chemical hazards to their customers and ensure chemicals are packaged safely and securely. The widely recognised CHIP hazard symbols show a black symbol on an orange background. From 1st June 2015, CHIP will be replaced by the European CLP Regulation. However, the UN aims to create one universal system entitled “The Global Harmonised System of Classification and Labelling of Chemicals (GHS)”, so all countries will follow the same classifications. The ‘CLP Regulation’ or ‘CLP’ came into force in January 2009 and is a European regulation for the classification, labeling and packaging of substances and mixtures. It is a regulation in all EU Member States, including the UK. The regulation requires companies to appropriately classify, label and package substances before placing them on the market. This is a way of protecting handlers, consumers and the environment as it warns them of dangers and precautions to take when handling a particular package that may present a hazard. The CLP Regulation adopts the United Nations’ Globally Harmonised System on the classification and labeling of chemicals (GHS). CLP Regulation is a mechanism to ensure the GHS agreement is legally binding, as it is currently voluntary rather than a law. CLP is expected to facilitate global trade and the harmonised communication of hazard information of chemicals, and it incorporates the classification criteria and labeling rules agreed at UN level (GHS). However, CLP introduces new classification criteria, European hazard symbols and Risk and Safety Statements. A Certificate of Analysis is usually provided to the consumer after the sale of a product that has been tested to a certain specification. It is an authenticated document, issued by an appropriate authority, that confirms that a product has undergone the necessary regulations and that it meets the quality standards it is supposed to. It is a particularly important document for industries that require strict testing and regulations, to ensure complete safety and quality. CofA commonly contain the actual results that have been obtained from the testing, performed as part of quality control of an individual batch of product. It is a way of giving the end user confidence in the quality of the product. A CofA gives the exact details about a product’s compliance to specifications. There is a fairly extensive list of other items that belong on a CofA which includes details of the supplier, the category and details of the batch or product, and details of the tests carried out. A Certificate of Conformity is a form of documentation which demonstrates that a product has been manufactured in accordance with a rigorous quality system. It differs in a small way from CofA because a CofC is a document that is certified by a competent authority to say that the supplied goods or service meets the required specifications. However, this does not typically include specific test conditions, test parameters, test specifications or expected/final results. The CofC is processed to indicate that products supplied meet all of the order specifications, which the supplier must provide to show that the product has been manufactured to the exact guidelines they were given. A composite drum is a double-secured container used to transport hazardous materials. It is double-walled, meaning it’s comprised of two materials – plastic and steel- to contain and secure particularly volatile substances. The steel part ensures the strength and durability of the container, whilst the plastic is a safer option for chemical substances, which may react with other materials. The drums must meet stringent packaging requirements to be used in the chemical industry, to ensure complete safety and stacking capability. ECHA is the European Chemicals Agency which exists to ensure that chemical companies comply with the legislation in place for safe use of chemicals. ECHA provides information on chemicals and addresses chemicals of concern. The EU has strict chemical legislation in place for the benefit of human health and the environment, and ECHA ensures that regulatory authorities are continuing to enforce these legislations. The agency is independent from external interests and impartial in the decisions they make, which are science-based. ECHA strives for the safe and sustainable use of chemicals to improve the quality of life for citizens in Europe, as well to minimise harmful effects to the environment from chemicals. EP stands for European Pharmacopoeia and describes the European requirements in place to ensure products are at a particular standard. EP describes the quality standards for ingredients, dosage forms and methods of analysis for medicines. The European Pharmacopoeia is a single reference work to provide common quality standards throughout Europe. The official standards are published as regular editions and provide a legal and scientific basis for quality control during the development, production and marketing processes of medicines. The standards govern the tests that need to be carried out on medicines and on the raw materials involved in the production of pharmaceutical products. Find out more about the European Pharmacopoeia on the European Directorate for the Quality of Medicines website. 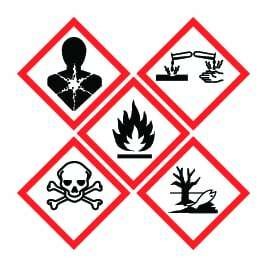 GHS (Globally Harmonised System of Classification and Labelling of Chemicals) states that labels on chemical goods have to contain appropriate hazard information and symbols, as well as explain the protective measures that need to be put in place for each individual product. GHS ensures the safe use, transportation and disposal of chemicals throughout the globe and its existence means that chemicals producers are able to understand and interpret labels from other countries, given the reality of the extensive global trade in chemicals. GHS classifies chemicals by types of hazard and proposes ways to communicate these hazards, as a way of protecting human health and the environment. HDPE is a high density polyethylene thermoplastic used for a number of applications such as storage and packaging. Specifically for the chemical industry, it is used for chemical drums, jerricans and bottles. It is effective for chemical packaging as it is resistant to many chemicals, low cost, flexible and can withstand both high and low temperatures. It is stronger than standard polyethylene, is an effective barrier against moisture and remains solid at room temperature. Chemicals in a HDPE container are secure, as HDPE will not allow chemicals to leak or escape. Hermetically sealing a container involves using an open flame and is the process of completely sealing a container. The seal prevents glass shards from packaging from contaminating the product inside, as well as protecting the product from any airborne contaminants. At ReAgent, we use hermetical sealing for our ampoule filling service. The container will be airtight, and is usually made of glass. The seal of the packaging will be strong enough to prevent the flow of gases, moisture and any other materials. Food companies often use packaging that is hermetically sealed, as it is a way of ensuring that food doesn’t get contaminated and so remains fresh for longer, without adding lots of preservatives. Health and Safety Executive is the national independent watchdog for work-related health, safety and illness. HSE is a regulator that works to reduce work-related injury and death across Great Britain. HSE regularly leads reviews of health and safety to ensure that standards are maintained and see where changes need to be made to reduce the chance of injury or death. HSE takes action against those who put workers at risk. HSE publishes numerous publications each year to help businesses understand how laws to keep people safe at work affect them. These publications include legislation around the protection of workers and HSE often challenges existing European legislation where they think rules can be improved. An IBC – or Intermediate Bulk Container – is an industrial container used for the storage and transport of bulk substances. IBCs typically hold products in sizes of 1000 litres, although this does vary, and can be made from a range of materials, including HDPE, aluminium, wood and carbon steel. IBCs usually come with a tap (where the substance can be poured into smaller containers) as well as top access to the product. IBCs usually feature cages or bases that are designed for easy transportation by vehicles such as fork lift trucks. The benefits of choosing IBCs include low transit costs, efficient space utilisation and good compatibility with many substances, including hazardous materials. IIP is an award given to companies that are committed to providing their employees with up-to-date training, development opportunities and support. An Investors in People award shows that a company appreciates its staff and continues to dedicate time and money to the development of staff. ReAgent was given an Investors in People award in 2006. Investors in People help companies to realise the potential of employees and continuously improve standards. IIP holds awards, for which companies can be shortlisted and awarded for their demonstration that they are a top employer. Some categories for these awards include ‘Excellence in Leadership and Management’, ‘Most Innovative People Strategy’ and ‘Leader of the Year’. The ISO is the International Organisation for Standardisation, which develops and publishes international standards for companies to adhere to, in order to gain certificates to prove their standards. A standard is a document that provides requirements and specifications that can be used consistently to ensure that a company’s products, processes and services are fit for their purpose. There are over 19,500 International Standards available to ensure products and services are safe, reliable and of good quality. International Standards help to harmonise standards across the globe, so all countries are working to the same specification and international trade barriers can be broken down. They also provide evidence that a company is adhering to certain standards, so may make companies more attractive to customers. The ISO 14001:2004 Environmental Standard is a standard set by the International Organisation for Standardisation. The information contained within the policy is available for the benefit of third party stakeholders, including customers and suppliers. The Environmental Standard states that companies must minimise the impact that they have on the environment. For example, by being considerate with the resources they use, such as water, energy and raw materials and with a positive approach to waste management. Companies must also minimise the risk of problems such as pollution and nuisance, to avoid harm to people and the environment. Companies with an ISO 14001 must define actions and monitor their performance to ensure they meet their commitment to the environment. The ISO 9001:2008 Quality Standard is a standard set by the International Organisation for Standardisation, for harmonised standards throughout the world. Companies which are accredited with the Quality Standard are committed to continually improving their quality management system. This can include setting objectives and monitoring progress of these aims, as well as ensuring all employees are made aware of the organisation’s commitment and their own responsibilities under the system. The Quality Standard specifies that companies should manufacture and supply products that meet customer requirements and annually review the statements of the policy for relevance and applicability of the organisation. A jerrican (also called jerry can or jerrycan) is a large, flat-sided container suitable for both storing and transporting liquids or gases. It was developed by German military engineers and adopted by British troops. It was given its name as “jerry” which was slang for “German”. Jerricans are commonly made of HDPE, meaning they are resistant to chemical attack and can hold most hazardous substances. Its flat side allows for efficient use of storage space. Jerricans often include a tap for dispensing and distributing liquids and commonly come with a vented cap, in case they are holding a gas which could expand and cause dangerous amounts of pressure. ‘Lean’ is a term used in the manufacturing industry to describe a work culture that continuously strives to improve by eliminating waste and making small modifications each day. The waste that is being eliminated could be anything from production time and waste products to expenses, and by making small changes in all areas of a company, that company should continue to improve and become more productive, with better quality products. It limits over-production so a company is only producing the amount their customers need, and only when it’s required. A lean culture is one that’s embedded in a company. It allows all staff members the opportunity to voice their suggestions for change in the business, and all ideas are given considerations. The lean culture includes the continuous development of the workforce, so staff are monitored and given up-to-date training. A Material Safety Data Sheet (MSDS) is a document that is required by law to be accompanied with the sale of any substance or mixture described as hazardous. The regulations are set out by REACH and apply to all suppliers of hazardous chemicals. An MSDS must also be provided upon request for non-classified products that contain hazardous substances above certain limits. An MSDS is an important part of health and safety and it is intended to provide workers or handlers of the hazardous product with procedures for working with that substance in a safe manner. It also contains information about the potential health effects of exposure to the substance, as well as information about the manufacturer or supplier. OHSAS 18001:2007 is the Occupational Health and Safety Standard. The possession of this standard demonstrates that a company maintains an ongoing commitment to risk management and health and safety in the workplace. OHSAS 18001 is an internationally recognised British standard, developed by leading trade and international standards bodies. It provides the framework for organisations to instigate effective management of health and safety in the workplace. The standard is suitable for any type of organisation that wants to be legally recognised as being efficient in managing health and safety in their workplace. PE stands for Polyethylene; the material used for sachet laminates and labels, and it has a very simple structure. PE is a common thermoplastic, meaning it can withstand higher temperatures than most plastics. It can be classified into several different categories, which are largely defined due to variables such as branching and density. Its categories include HDPE (High Density Polyethylene) and LDPE (Low Density Polyethylene). The term Laser print PE refers to the material used for printing on, usually for labels on products. These labels are highly durable and adhere to BS5609, meaning they can still be legible after being immersed in sea water for three months. A peristaltic pump is a mechanical pump in which pressure is provided by the movement of a constriction along a tube, used for pumping a variety of fluids. The fluid is pumped through a flexible tube, which gets compressed by the rotating mechanism it encircles. As the mechanism rotates, it pushes down on the tube, forcing the fluid to travel throughout it. The idea comes from a human bodily function which has some similarities. ‘Peristalsis’ is the succession of waves of involuntary muscular contractions of various bodily tubes, which transport food and waste products. For chemical applications, the tubing must be compatible with acids and other toxic liquids, but also needs to be elastomeric to maintain the circular cross section even after lots of cycles through the tube. PET stands for a type of plastic known as poly(ethylene terephthalate). It is a thermoplastic polymer resin of the polyester family used in synthetic fibres. It is a common plastic and considered to be safe for applications such as water bottles and food containers. Pet is hydroscopic, meaning it absorbs water well from its surroundings. This allows the material to be processes using a common moulding machine and then dried. It is commonly used in the chemical industry as it is versatile and strong, as well as being unreactive to most chemicals. The chemicals in the plastic do not leak into fluid or food stored within it, which is why it’s so widely used in the food industry. Along with most other thermoplastics, the recycling of PET is very practical and advised. PFMEA stands for Process Failure Mode and Effects Analysis. Before the preceding ‘P’ was added, the term was FMEA, which describes one of the first systematic techniques for failure analysis. It was developed by engineers in the 1950s to study problems that might arise from malfunctions of military systems. FMEA is often the first step in checking the reliability of a system. It involves reviewing components and assembly to identify the causes and effects of failure. In the mid 1970s, The Ford Motor Company brought PFMEA to the automotive industry. The same process was applied, and it provided an analysis of automotive vehicles to consider potential failures prior to launching production. The use of PFMEA has become more widespread and is now applied in a number of different industries. It is a powerful prevention tool, as it anticipates failures before they actually occur. The pH of a solution is the figure measuring its acidity. Solutions with a low pH (1-6) are said to be acidic, whilst solutions with a pH greater than 7 are classed as alkalis. Pure water has a pH of around 7. pH is measured using an indicator. An indicator is a substance that changes colour depending on whether it is placed in acidic or alkaline conditions. When in an acid, the indicator would turn red and in alkalis, it would turn blue. The pH scale is used as a universal indicator to measure the colour change of a solution, and this shows the value of the pH on a scale. We can also measure pH in the body; including the pH of cellular compartments, bodily fluids and organs. This is a good way to check for an acid overload in the body, or an excessively high blood pH. PPAP is used in the automotive industry to act as proof that every process involved in production has been thoroughly planned out and then tested to ensure consistency of products. It is vital in the automotive industry where standards are so high because safety cannot be compromised. PPAP is used throughout the supply chain to ensure that standards are being followed at every stage of the production process, even by outside companies where various processes have been outsourced. This shows that the component supplier has developed their design and production process to meet the client’s requirements, minimising the risk of failure or mistakes. The PPAP is usually provided to the client in the form of a document after the work has been carried out. REACH is a regulation that controls the Registration, Evaluation, Authorisation and Restriction of Chemicals. REACH is applicable to the European community and is concerned with the safe use of chemicals, aiming to protect human health and the environment through the identification of the properties of chemical substances. REACH requires that chemical manufacturers register information of chemical production onto a database, to include information about the substances manufactured in Europe. Details must include the chemical and physical properties, toxicity, environmental issues and the amounts produced or imported. This practice ensures that anyone in the chemical industry has access to information about chemicals they’re using and allows the free movement of substances on the EU market. A sachet is a sealed bag or packet that contains a substance in small quantities. Sachets are particularly useful for holding liquids, powders, creams and gels and are ideal for companies looking to provide a sample of their products, as they can be produced quickly and in high quantities. Sachets can be comprised of a mixture of materials and for this reason are useful for the packaging of chemical substances. Mixtures with different properties can be combined, to ensure the final material is the safest option for the substance it holds. Some uses for sachets include food condiments, pot pourri sachets and sachets containing small toys. Tyvek is the name of a brand of high-density polyethylene fibres, which is a registered trademark of DuPont. Tyvek materials are manufactured using a flash-spinning process without the use of binders. This means the final structure is durable and can outperform most conventional packaging materials. It is often used as a sachet material as it is very strong and difficult to tear, and water vapour can pass through it but liquid water cannot. Additionally, Tyvek materials are water resistant and can withstand most chemicals. Bags and sachets made from Tyvek will not leak during shipping and storage, and it has great tear and burst resistance. Tyvek has a wide range of applications including protective clothing, housing insulation and medical and industrial packaging. Ultraviolet-visible spectroscopy refers to absorption spectroscopy or reflectance spectroscopy in the ultraviolet-visible spectral region. This means it uses light in the visible and adjacent ranges. The absorption or reflectance in the visible range directly affects the perceived colour of the chemicals involved. UV/Vis spectrophotometry offers high flexibility and the UV region is considered to be any wavelength less than 340 nm (nanometres). Nucleic acid, purified proteins and other organic modules are often measured in the UV region. A vented cap is often placed on top of a container holding a chemical substance (such as a composite drum), in order to secure the substance. Sometimes gases can expand and cause too much pressure on the container. A vented cap is designed to allow some amounts of air into the container, so that when the pressure reaches a certain point, the valve opens by a small amount and relieves some of the pressure. A vented cap is a one-way system; air is allowed in, but fumes cannot escape from the cap as they can present a threat to users and the environment.